The casserole (read here other news) is an ideal meal because it requires only “one pot” cooking. The Chili Relleno Casserole brings with it a blend of flavours and tang which help to make it interesting for a quick family meal. You will need 2 cans of whole green chilis, drained, 1 pound of shredded Cheddar cheese,4 eggs , 2 tablespoonsall-purpose flour, 1/2 cans of evaporated milk , 1 poundshredded Monterey Jack cheese, and 2 cans green enchilada sauce. First preheat and oven to 400 degrees F and grease a 9×13-inch baking dish. Next, split open the chilis and spread half the amount into the bottom of the baking dish. Add the shredded Cheddar cheese and top with the remaining chilis. Next whish the eggs evaporated milk, and flour and pour the mixture over the prepared chilis and cheese. Once finished, put the baking dish in an oven and bake for about 30 minutes or until set. Remove the casserole from the oven and add Monterey Jack cheese. 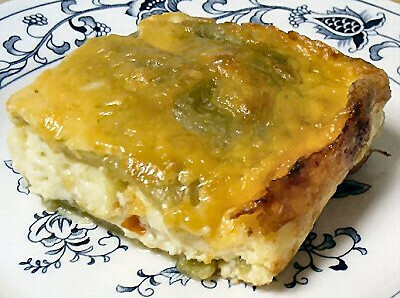 Pour the green chili salsa on top and place in the oven for a further 15 minutes or until cheese is melted.